Background: The majority of victims of domestic violence sustain maxillofacial injuries. Dental professionals can play a vital role in preventing violence against women, helping identify abuse early, providing victims with the necessary treatment, and referring women to appropriate care. 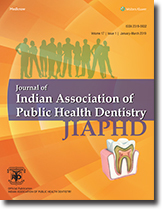 Aim: The aim of this study was to assess the level of knowledge, attitude, and behavior regarding domestic violence among dental health practitioners in India. Materials and Methods: The authors surveyed a random sample of 106 dental health practitioners using a pretested, structured, and validated questionnaire to evaluate their knowledge, attitude, and behavior regarding domestic violence. Survey items were developed based on the domestic violence and health-care literatures. Collected data were subjected to statistical analysis using Chi-square test, and P < 0.05 was considered statistically significant. Results: Sixty-four percent of the responding dentists believed that it is not their responsibility to screen patients for abuse; 7.5% never screened for abuse, even when signs of abuse were present; and 34.9% did not have enough time in their practice to raise the issue of domestic violence. The majority of respondents believed that domestic abuse should be a private matter and asking about abuse is an invasion of privacy. Female respondents' attitude toward domestic violence was more positive when compared to the males. Conclusion: The level of knowledge regarding domestic violence among the respondents was insufficient. The findings of this study strongly recommend that this issue be included in the undergraduate dental education curriculum to improve the health care and assistance provided to the victims of abuse. Background: The dental and medical practitioners are required to continuously update their knowledge and skills with respect to new diagnostic and treatment modalities to provide the patients with optimum treatment needed. Owing to a large amount of advances, it is almost impossible for dental and medical practitioners to keep track and be aware of all the updates. 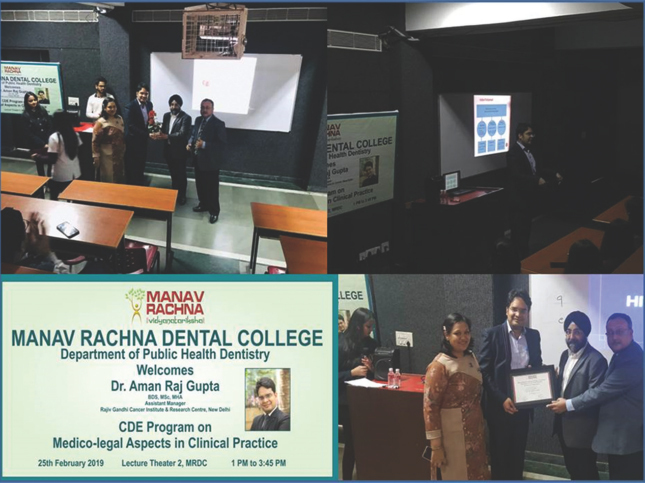 Aim: The aim of this study is to assess and compare the knowledge, attitude, and perceived barriers toward evidence-based practice (EBP) among dental and medical academicians and private practitioners in Pune city. 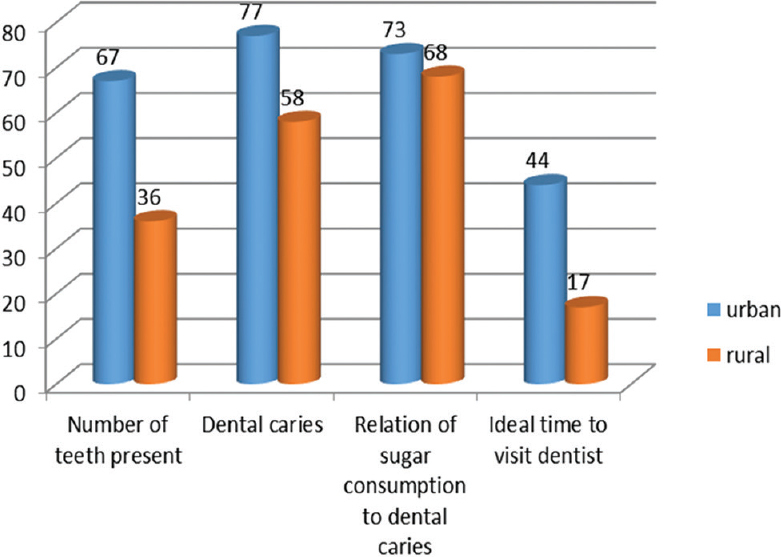 Materials and Methods: A cross-sectional study was conducted among dental academicians (n = 150) and private practitioners (n = 150); medical academicians (n = 150) and private practitioners (n = 150) in Pune city. Data were collected using self-administered, pretested, validated, close-ended, structured questionnaire. Data were analyzed using unpaired t-test and analysis of variance using Statistical Package for the Social Sciences (Version 21.0). Results: The mean knowledge score of dental academicians, dental private practitioners, medical academicians, and medical private practitioners was 4.13±1.38, 3.03 ± 1.99, 4.94 ± 1.58, and 3.033 ± 1.99, respectively. 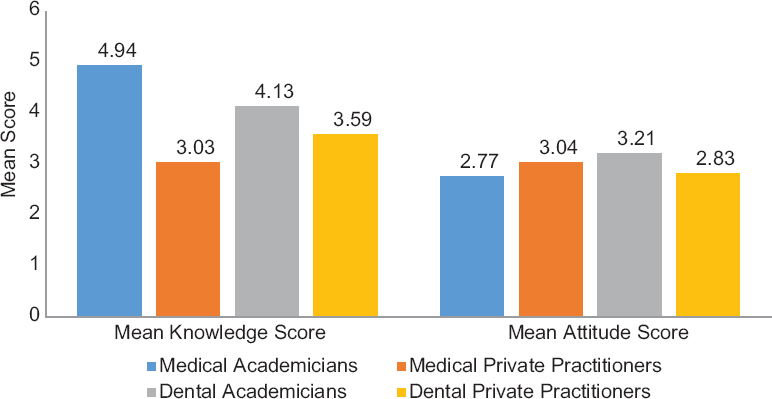 A statistically significant difference between the mean knowledge score of dental academicians was seen as compared to the other three groups (P < 0.001). The attitude of dental and medical professionals toward EBP was positive. The important barriers to its use included lack of available time and lack of application of evidence in patients. Conclusions: It was found that significant proportion of respondents had inadequate knowledge of EBP; therefore, formal training and reinforcement are required. Background: Temporomandibular disorders (TMDs) have been recognized as common orofacial conditions which cause considerable pain. Apart from dental caries and periodontal diseases, TMDs are becoming significant ailment affecting individuals due to their magnitude and impact on individuals. 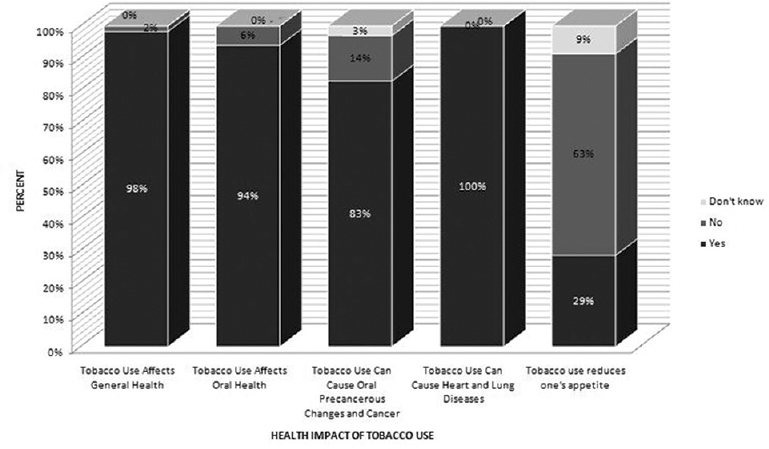 Few studies have examined the impact of TMDs on oral health-related quality of life (OHRQoL) in adolescents, especially in the Indian context. Aim: To assess the factors affecting the impact of TMDs on OHRQoL among 12 to 15-year-old schoolchildren in Mangalore. Materials and Methods: A cross-sectional study was carried out among 12 to 15-year-old schoolchildren in Mangalore. Signs and symptoms of TMDs and parafunctional habits were analyzed using a screening questionnaire recommended by the American Academy of Orofacial Pain. OHRQoL was measured by the 16-item version of Children Perception Questionnaire (CPQ11-14). Malocclusion was also assessed using Dental Aesthetic Index (DAI). Data were analyzed using Statistical Package for the Social Sciences (SPSS) software, version 14 (SPSS Inc., Chicago, IL, USA). Chi-square test and step-wise multiple logistic regression test were employed. P < 0.05 was considered statistically significant. Results: TMDs showed statistically significant association with OHRQoL among the schoolchildren (P < 0.05). Parafunctional habits and malocclusion were also significantly associated with both TMDs and OHRQoL among the study participants. Multivariate analysis found few parafunctional habits and malocclusion to be the significant predictors for both TMDs and OHRQoL (P < 0.05). Conclusion: Parafunctional habits, malocclusion, and TMDs had statistically significant association with OHRQoL. Parafunctional habits and malocclusion were found to be significant predictors for both TMDs and OHRQoL. TMDs and the associated factors have an impact on the psychosocial functioning of the children. This study emphasizes the importance of OHRQoL assessment for evaluating TMD patients because it can have a substantial impact on functional, emotional and psychologic aspects, thus negatively affecting the OHRQoL of children. Background: The human immunodeficiency virus (HIV)/acquired immune deficiency syndrome (AIDS) epidemic probably represents the greatest public health problem in India and the world today. Education and awareness of the society forms an integral part of the global effort to prevent and control the spread of AIDS. Aim: The aim of this study was to evaluate the levels of knowledge, attitude, and practice toward HIV/AIDS among various schoolgoing children, teachers, and parents in urban and rural areas of Mangalore, Karnataka. Materials and Methods: The cross-sectional study was conducted among a sample of 1535 respondents comprising students, teachers, and parents associated with three rural and two urban schools, by means of a structured questionnaire encompassing knowledge, opinion/attitudes, and practices related to HIV/AIDS. Descriptive and inferential statistics have been applied. Inferential statistics included independent sample t-tests, one-way ANOVA, and Chi-square test. Results: The results suggest a considerable difference in the levels of awareness among the urban and rural population. Furthermore, teachers display significantly greater knowledge about HIV/AIDS, followed by parents and then students. Based on the knowledge scores, the sample population was divided into three categories as follows: high, medium, and low. Nearly 90% of the teachers have high level of knowledge whereas only 40% of parents and 14% of students display high-level knowledge. The results also suggest that urban and rural respondents have acquired knowledge from different sources regarding HIV/AIDS. While friends are the main source of information for the urban respondents, the rural sample draws their knowledge from newspapers and TV. Conclusion: The study suggests that despite the various government-aided programs for HIV/AIDS awareness among schoolgoing children, there still exists a significant difference in the knowledge and awareness between rural and urban populations. The study notes that a sizeable number of children attending rural government schools still lack adequate knowledge about HIV/AIDS. Introduction: School teachers play a vital role in the overall development of a child. They can be used to combat diseases of a preventable nature as alternate personnel in primary health care. With proper knowledge and oral health practices, they can contribute to the health education of children and act as role models for the general community at large. Aims: To assess and compare the knowledge and practices regarding oral health among school teachers in rural and urban areas in Chennai, Tamil Nadu, India. Materials and Methods: A questionnaire consisting of 15 close-ended questions on oral heath knowledge and practices was formulated and distributed among 200 school teachers in rural and urban areas in Chennai, Tamil Nadu, India. The data obtained were subjected to statistical analysis using SPSS software version 17, and Chi-square test was used to assess the differences in the proportions for various questions. P < 0.05 was considered statistically significant. Results: The school teachers in both rural and urban areas had limited knowledge on oral health. The extent of knowledge and oral hygiene practices among the urban school teachers was found to be comparatively higher than those of the rural school teachers. Further, 11% of the urban school teachers and 53% of the rural school teachers did not discuss oral hygiene practices with their students (P < 0.001). Conclusions: The school teachers in both rural and urban areas had limited knowledge on oral health. The extent of knowledge and oral hygiene practices among the urban school teachers was found to be comparatively higher than those of the rural school teachers.